TetriScope is a combination of the application scheduler TetriSched and the visualization tool Atlas, both integrated into Hadoop's resource manager Yarn. 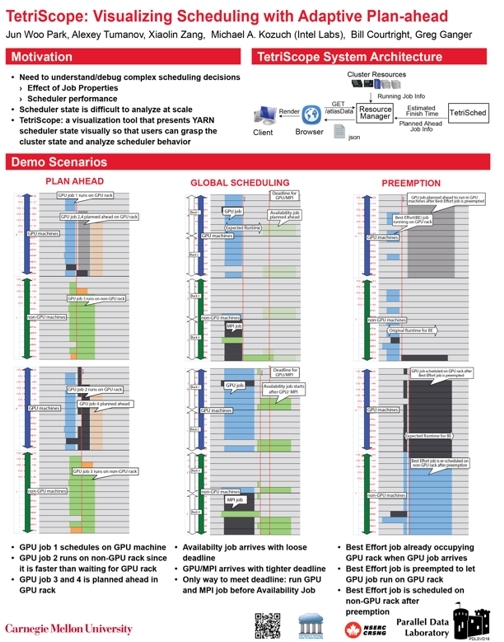 TetriSched is a high performance plan-ahead scheduler created by PDL researchers. It has been integrated into Yarn to serve as a pluggable scheduler. See the following diagram for a sketch of TetriSched. Atlas is web-based user interface developed by PDL. It has been integrated into Yarn's web site to provide a graphic view of the scheduled applications. Although it is initially designed to help researchers refine the TetriSched scheduler, Atlas is a scheduler independent UI, capable of working with any Yarn scheduler. Following is the TetriScope system diagram, screenshots and interpretation. In addition to providing detailed view on how an application is scheduled on various nodes in a data center, Atlas provides a high-level view of aggregated load on per-rack basis for large data centers. It also provides a highly-manipulable timeline for the user to zoom and swipe to adjust the desired time window for viewing the applications. Following are screencasts of TetriScops showing three scheduling scenarios. They also showcase certain features of Atlas, such as viewing aggregated load and timeline manipulation. For best results, use full screen to play. Click to download a full resolution mp4 version of this video. TetriSched: Space-Time Scheduling for Heterogeneous Datacenters. Alexey Tumanov, Timothy Zhu, Michael A. Kozuch†, Mor Harchol-Balter, Gregory R. Ganger. 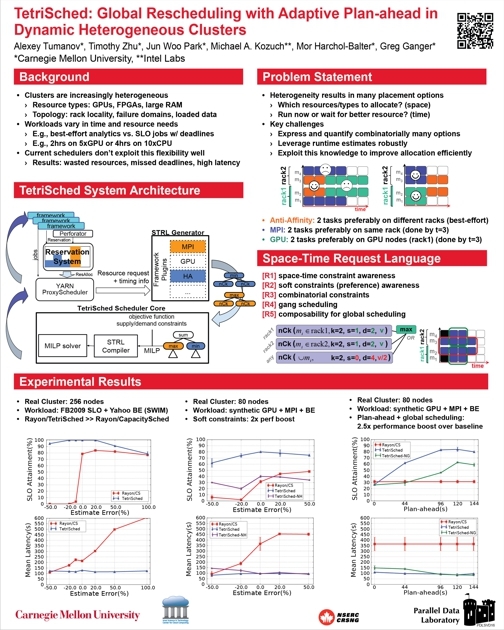 Carnegie Mellon University Parallel Data Lab Technical Report CMU-PDL-13-112, December, 2013.